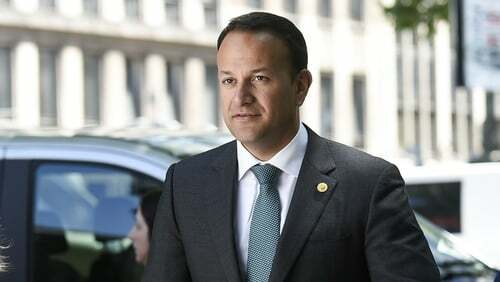 Taoiseach Leo Varadkar is in Brussels for a two-day summit at which EU leaders will warn the UK that the Brexit Withdrawal Agreement and the two-year transition are at risk if London does not make more progress on agreeing the so-called backstop to avoid a hard border on the island of Ireland. The first day of the summit will be dominated by the political fallout in Europe over the huge migration flows from Africa and the Middle East. This had once been billed as a critical staging post in the Brexit negotiations, with the UK under increasing pressure to agree to a legally operable backstop arrangement. EU leaders will reprimand the UK for its glacial progress on the issue. There will be a warning that the transition period is at risk if the Irish protocol is not agreed by autumn, and a call for member states to increase their preparation for a no deal scenario. Mr Varadkar said: "The lack of progress in the negotiations on the withdrawal agreement has been very disappointing. But this is not going to be the showdown that had once been expected. That is partly because many other big complex issues have crowded the agenda. British Prime Minister Theresa May admitted the need to make "faster" progress in Brexit talks. Arriving for the summit in Brussels, Mrs May insisted there had been "very good progress" so far. But she acknowledged: "I think both sides are keen to continue that work at a faster pace than we have done up till now." Mrs May urged the European Union to consider Europe's safety before cutting Britain adrift from its security architecture, as she sought to push Brexit talks forward to address future ties. At an EU summit focused more on a crisis over migration than Brexit, Mrs May came under pressure to move on with the all-but-stalled talks and consider softening some of her "red lines" to prevent Britain from crashing out of the bloc without a deal. She has hesitated to spell out detailed plans for Britain's departure from the EU because of divisions in her ruling Conservative Party and government over the terms of Britain's biggest foreign policy shift in almost half a century. But in an attempt to get some control back over the talks, Mrs May used a dinner with EU leaders to underline Britain's role in keeping Europe safe, sharing information freely to solve serious crimes and prevent militant attacks. "Our ability to do so is being put at risk," Mrs May told other EU leaders, according to a senior UK government official. "The existing legal frameworks for third countries will not allow us to realise the ambitious future security partnership that I believe is in all our interests ... That is not what I want and I do not believe it is what you want either." With only nine months before Britain leaves the EU, Mrs May is under increasing pressure in Brussels not only to come up with ways to settle a divorce agreement, including a proposal for a new border on the island of Ireland, but also to detail her vision for future ties once outside the bloc. The aim remains to secure a deal by October, to give it time to be ratified ahead of March 2019 when Britain will formally leave the European Union. But there is frustration among EU leaders that the talks have become stalled on the thorny question of how to avoid border checks between Northern Ireland and the Republic of Ireland after Brexit. Mrs May's government is also distracted by in-fighting over the future economic relationship with Europe. "I would like our British friends to make clear their positions," said European Commission President Jean-Claude Juncker. He repeated that the EU was working on the possibility that the talks collapse, saying: "We have to do it." Dutch Prime Minister Mark Rutte said the Irish issue "has to be solved", adding: "I am not losing patience but time is getting shorter and shorter to come to an agreement." He added: "I do understand it is difficult to come to an agreement within her cabinet and the UK parliament, but she has to." Mrs May will briefly update the other 27 EU leaders on Brexit at dinner tonight, and they will discuss the issue without her tomorrow. She is expected to hold one-to-one talks with some fellow leaders on the sidelines of the summit and over the course of next week. This evening, she will meet Mr Varadkar, who is expected to press her on the urgent need for progress on the backstop to avoid a hard border. One senior EU official dubbed it the "mother of all summits" because of the huge number of key issues that leaders are under pressure to resolve at the two-day meeting. Minister for Agriculture Michael Creed said the Government was extremely disappointed at the rate of progress on the backstop issue. He said Government Departments were taking all the necessary steps for a worst case scenario, while hoping that a deal can still be reached. One important issue, he said, was the fact that most of the Irish agri-food exports access mainland EU through the land bridge of the UK. The minister said bilateral engagements with member states had taken place to ensure that Irish products would not be disadvantaged, if they arrive off the UK mainland. Meanwhile, the head of Insurance Ireland has said insurance companies were preparing contingency plans for a hard Brexit and their priority was in relation to contract certainty for their customers. Kevin Thompson said many companies in the general insurance market were regulated by the Central Bank of Ireland. He added that many companies that were regulated by the UK regulatory authorities, but have a branch in Ireland, had begun activating plans to get a regulatory licence in Ireland. Mr Thompson said in a small number of cases, companies may decide not to service the Irish market anymore. Speaking on RTÉ's Morning Ireland, he said the market was well served by local insurers and that companies will keep customers up to date on the details of their policies.